Both Stanley and Carmen have OFA Hip Clearances (Stanley Good & Carmen Excellent), both have OFA Normal Elbows, OFA Eye Exam (Carmen's will be current within 12 months of the breeding), OFA Normal Heart clearance, (Carmen by a Board Certified Cardiologist), normal thyroid function, not on any medications, no skin allergies, seizures or other auto-immune disorders. Paw Print Genetics; Carmen is ICT Clear, PRA-Prcd Clear, PRA-1 Clear, PRA-2 Clear, DM Clear. Optigen/Antegene: Stanley is ICT Carrier, PRA-Prcd Clear. We are thrilled to announce this planned breeding and thank Janice Gunn for the opportunity to breed Carmen to "the Great One". 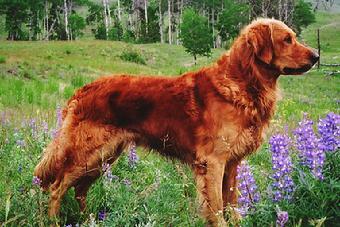 Stanley is a true legend in the Golden Retriever breed and his accomplishments and temperament were simply outstanding. For more information on Stanley please make sure to visit his webpage A once in a lifetime achiever! Our goal for this breeding is to produce intelligent versatile retrievers that are structurally sound, athletic, biddable and wonderful family hunting companions that could compete in many performance venues including field, obedience, agility, etc...! Both Stanley and Carmen have a lot to offer, they are very focussed, biddable, lots of drive to retieve, strong marking dogs, strong water dogs, strong work ethic, fun loving personalities and solid Golden temperaments. Paired together, these should be some fun puppies for experienced homes, we are very excited! The puppy pedigree has a low inbreeding coefficient and is a wonderful blend of field, performance and conformation Goldens.